Our fellows started off their first morning in DC with Kathryn Monet, CEO of the National Coalition for Homeless Veterans. Kathryn spoke on the organization’s mission to work with other community organizations to address housing issues among veterans, explaining “You’ve gotta’ have a community-wide approach” to tackle the complexity of veteran homelessness. The fellows then made their way into the Hart Senate Office Building, where they met with James Jarosz, Military Legislative Assistant at the Office of Senator Tammy Duckworth. James shared his personal story of how he became a legislative staffer and his experience working with individuals from both veterans and non-veteran backgrounds on Capitol Hill. When asked about how to better pursue leadership opportunities, he encouraged the fellows to seek positions within their local communities, where they can have a more immediate impact on the changes they wish to see. After a quick lunch, the fellows met with Congressmember Mark Takano, who invited the fellows to share their personal experiences with the GI Bill. He generated a conversation on efforts to improve the awareness and understanding of veterans benefits among those who need them the most. Congressmember Takano listened closely to the concerns of the fellows, and encouraged them to reach out after the meeting to further express their thoughts. Next, the fellows met with Ken Wiseman and Kayda Keleher, Associate Directors at Veterans of Foreign Wars and veterans of the US Navy and US Marine Corps, respectively. The fellows were inspired by the VFW’s advocacy of benefits for veterans and veteran families. 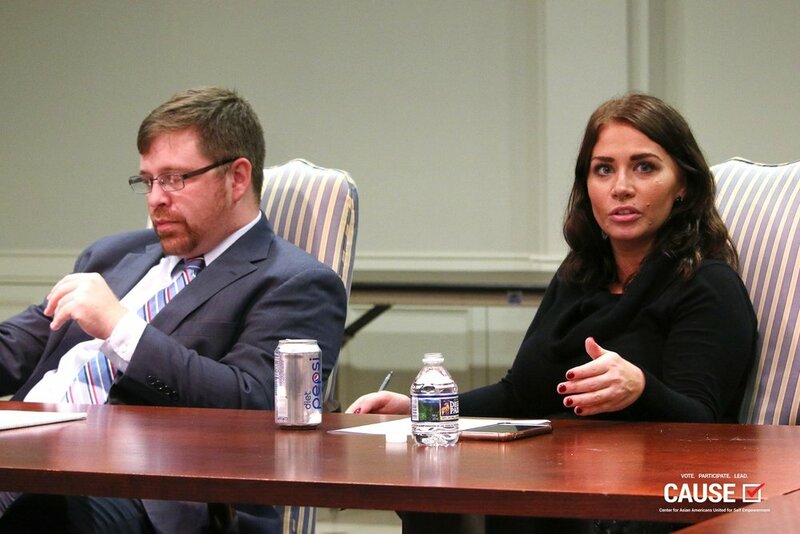 As veterans, Ken and Kayda conveyed their passion for ensuring that veterans’ concerns are heard and considered during the legislative process. For the last meeting of the day, the fellows heard from Justin Brown — Founder, Chairman of the Board, and Executive Director of HillVets. As the leader of a bipartisan organization, Justin stressed the importance of bringing community organizations together to facilitate collaboration across a wide variety of veterans issues and perspectives. The following day, the fellows had the opportunity to explore the monuments and history of Washington, DC. They enjoyed taking photos in front of the White House and various memorials, and also made visits to the Smithsonian Museums, including the National Museum of American History and Culture and the National Museum of African American History and Culture. We would like to thank Southwest for flying our 2017 Veterans Initiative fellows to Washington, DC! Newer PostVOICE Workshop #3: "Hope for the Future"